So here in Northern New England we have a dreaded 5th season known as mud season. It's the time just after the snow melts and just before the black flies start biting. Mud season is a sub-season of spring and in my case it means that I can't go near the boat until things dry out and the ground stabilizes. Of course there is a lot to do, but mud season gives me an excuse to find other things to do. 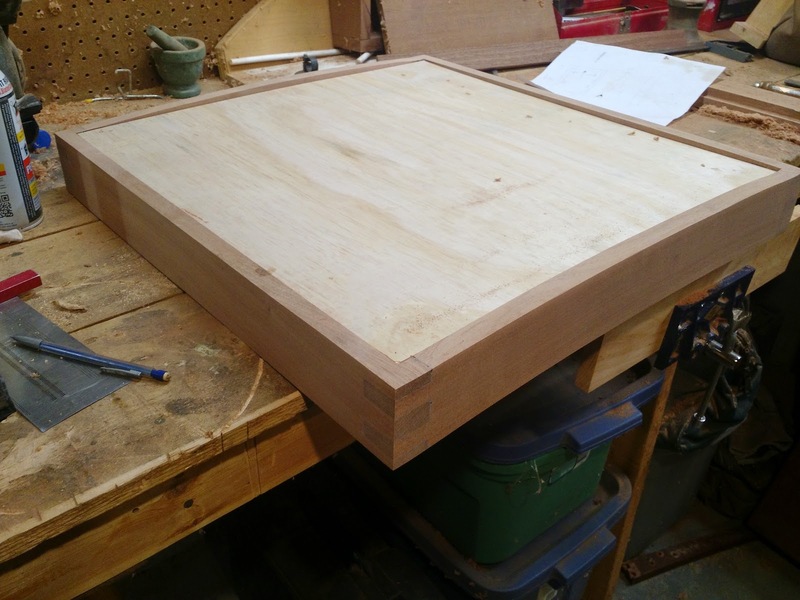 I have been picking away at finishing the forward hatch though, and I decided to get all artsy and see if I could do an inlay. 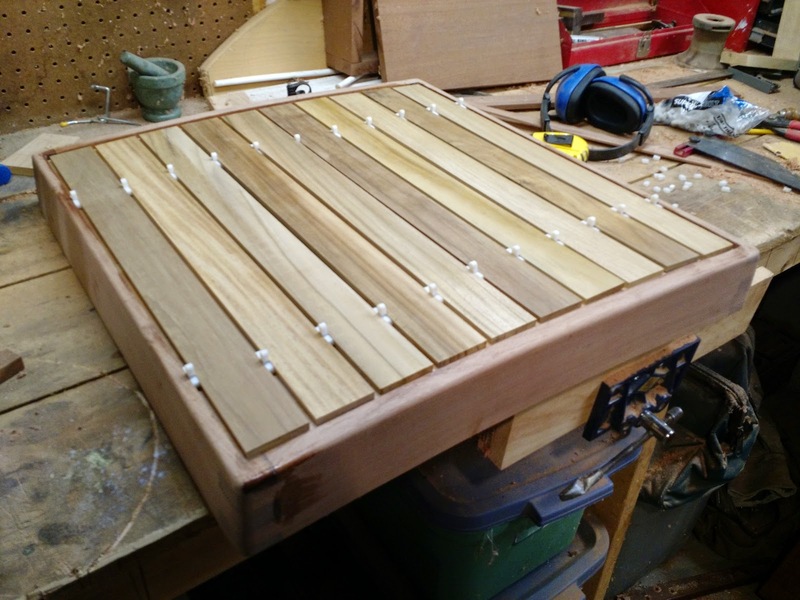 I've never really done inlays before so I cracked open the interwebs one night and found some good youtube videos by 'The Apprentice and The Journeyman'. Seemed easy enough so I gave it a shot. I didn't take any photos of the process because I never thought it would come out as nice as it did, but you can see the whole process on the link above. 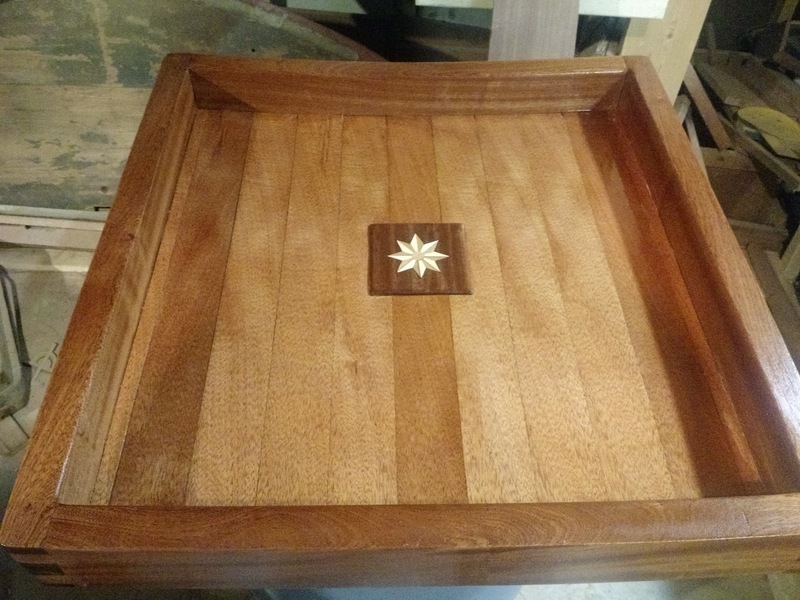 In any event, I decided on a compass rose with an alternating wood pattern, and I had some leftover teak from the top deck and a chunk of ash from the firewood pile. The ash is significant because it was a beautiful tree next to our house and my wife and daughter's favorite tree. Unfortunately, it came down during one of the snowstorms this winter and I had to cut it up. 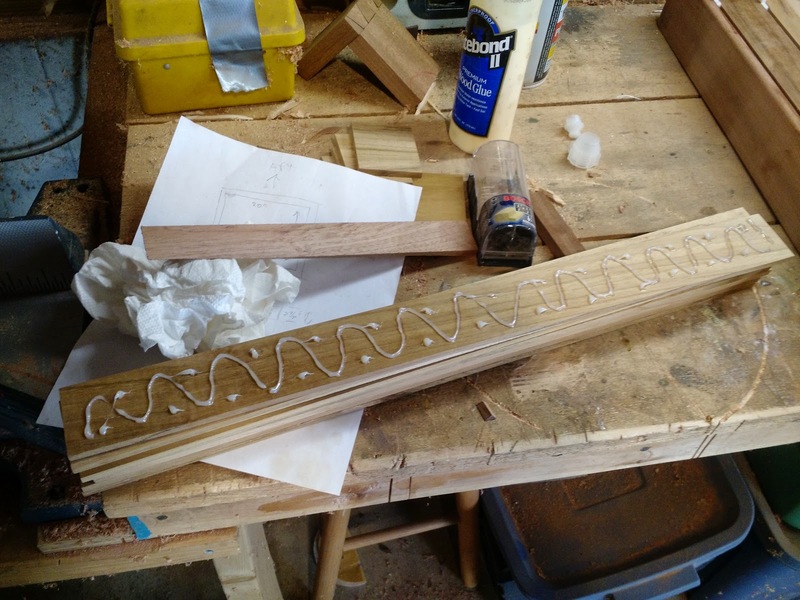 I saved a few pieces and cut them up on the bandsaw for use later on. The ash will live on. 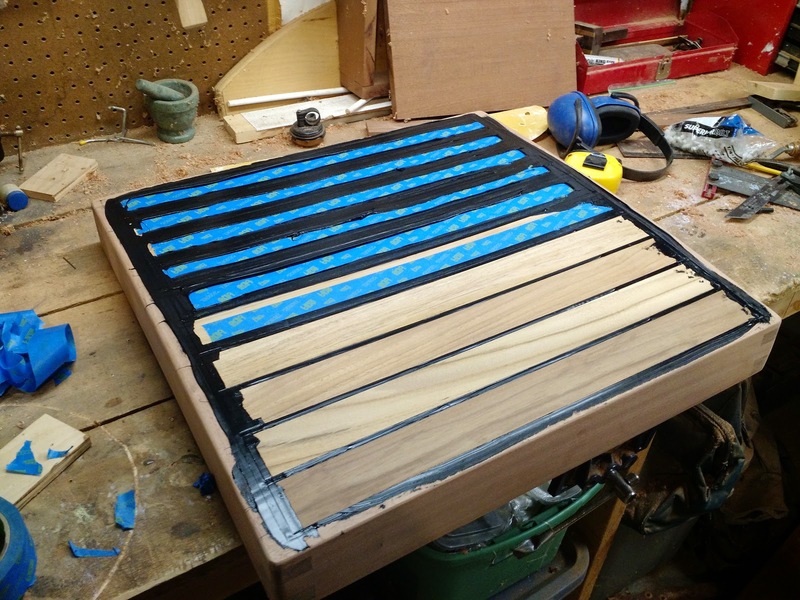 So with the help of the youtube videos I did some basic math and cut out a bunch of 22.5 degree wedges with a little jig I made for the bandsaw and glued them all up. 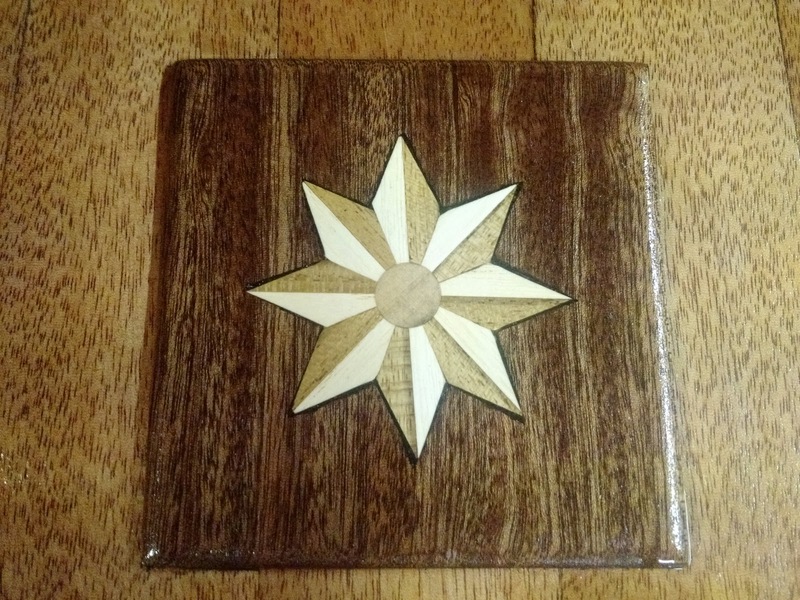 The result was surprisingly good, so I took then next step and traced the pattern on a piece of sapele and chiseled out the relief before dropping the glued up compass rose. 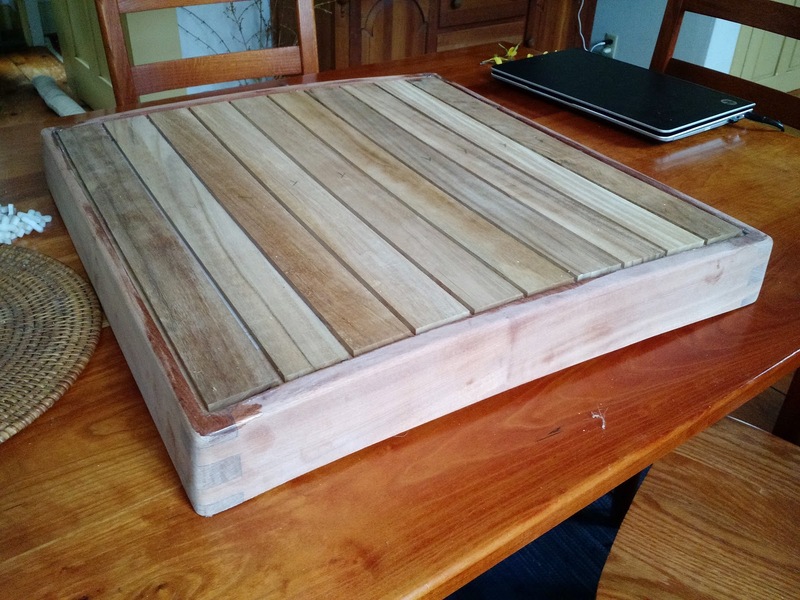 I sanded it all down and then embedded it along with a bunch of mahogany strips that I had left over on the underside of the hatch with epoxy. After a good sanding, I applied the first of several coats of varnish. 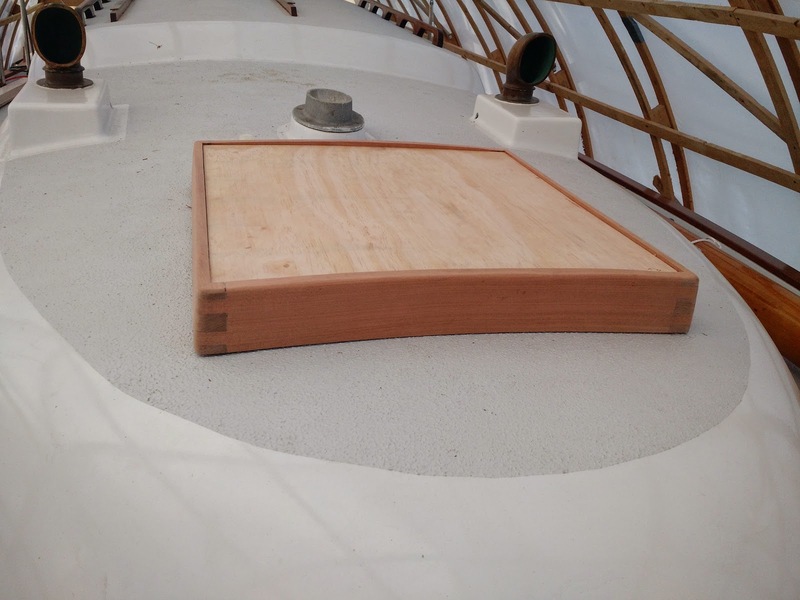 Next, once the ground hardens up and I can get on the boat again, I'll get the hardware mounted and adjusted and then it's just a matter of more varnish and I'll be done. Getting close now, I almost have a finished hatch on my hands. 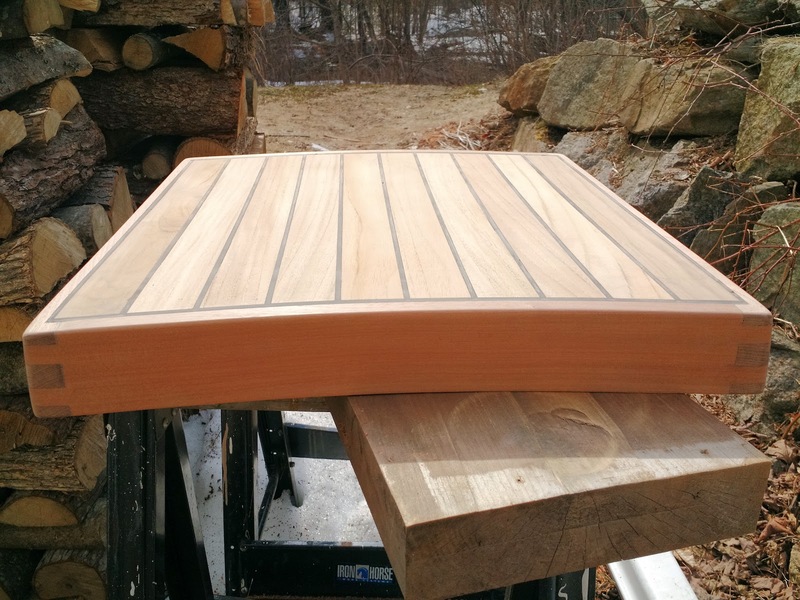 This was my first foray into Teak Decking Systems SIS 440 (or any teak seam sealer for that matter) and other than the long cure time, it was easy enough to use. 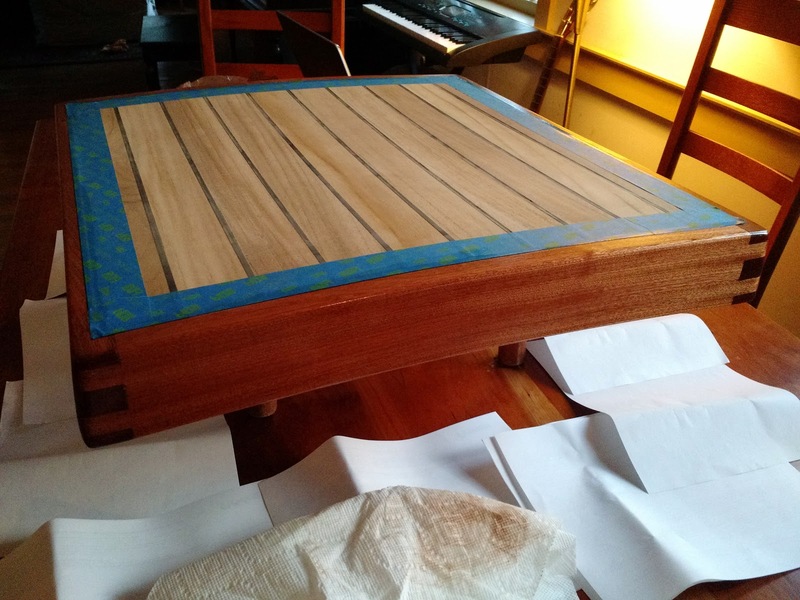 I started by taping off the teak planks between the seams to minimize cleanup. I don't think it's needed because everything needs to be sanded down anyway, but I'm sure it didn't hurt. Once everything was taped off pretty well, I clipped the end of the tube and popped it into a mechanical caulking gun. I squeezed out the black goo into each of the seams, letting it mound up behind the nozzle (as instructed). My cheapo mechanical caulking gun doesn't really have the leverage to easily get the caulking to flow and my hand quickly began to cramp. Fortunately, I have large gorilla hands, but someone with small hands or little hand strength would likely have some difficulty. 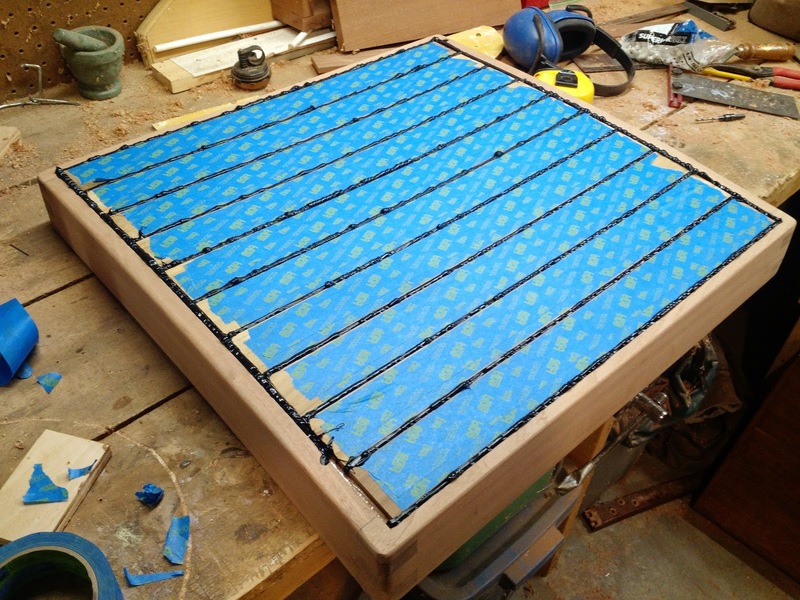 I literally had just enough caulking to get all the seams filled, but once complete I took a 1 inch piece of scrap wood and smeared each of the seams to make sure everything was filled and there were no bubbles. At that point I set it aside for 48 hours and let it cure up. This afternoon I tested out the caulking with my fingernail and decided it was cured enough to sand, so I took my random orbit sander and 60 grit discs and sanded everything flat. It cleaned up really easily and didn't take long to get nice crisp seams and that teak deck look. I finished up by putting a quick coat of varnish on the rails around the deck to get a feel for how the contrasting woods will look. Pretty sharp! 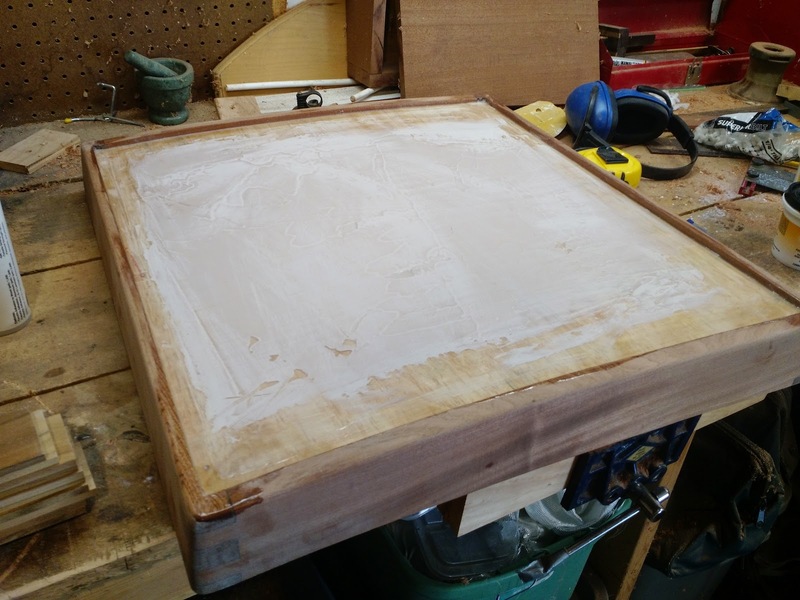 So, now there is lots more varnish to do and I will also epoxy in 1/8" mahogany strips to the underside of the deck to cover up the plywood and to provide a final layer for additional strength.